Address: Arpon, 5, Puerto del Carmen (Lanzarote), Islas Canarias. Located in Puerto del Carmen, on the south coast of Lanzarote, Apartamentos Oasis THe Home Collection offers accommodation 500 metres from the beach. Guests will find an outdoor swimming pool at the property. All apartments feature a living room, an independent bedroom, a kitchen, a spacious terrace or balcony and a private bathroom. All units offer direct-dial telephone and satellite TV. A safety deposit box is available for an extra charge. You can enjoy several activities at the property such as billiard and darts. Guests can also play golf and rent bikes nearby. Timanfaya National Park is 25 Km from the property. 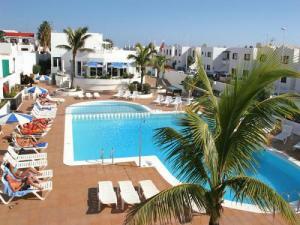 The nearest airport is Lanzarote Airport, 7 km from the property. Please inform Apartamentos Oasis THe Home Collection in advance of your expected arrival time. You can use the Special Requests box when booking, or contact the property directly with the contact details provided in your confirmation. Reception is open for Monday to Friday from 09:00-19:00 and Saturdays and Sundays from 09:00-16:00.